The Call Point Basic is our entry-level call point and ideal for use in most care environments, from larger hospitals to residential care homes. Its sleek, wall mounted design is simple to use. It is the perfect call assistance device for staff, patients or residents, whether positioned alongside the bed or in more general areas. The Call Point Basic has multiple programmable levels, including call, accept, priority, catering, assistance and emergency. These can be used to identify whether the patient needs the toilet, is hungry or thirsty, has fallen out of bed or simply requires attention. The Call Point Basic has a Code Blue option, vital for Cardiac and A&E wards, in addition to the innovative double push emergency function. The Call Point Basic is installed on the simple Intercall Bus network and can act as a central hub, allowing it to be tethered to remote devices such as pull-cords, pressure mats and pear leads. The portable transmitter provides a simple connection to assistive technology devices. It pairs wirelessly with the call system and can be individually programmed to raise the appropriate alert. The Call Point Standard has the functionality of the Call Point Basic and much more. Like the Call Point Basic, it is ideal for use in most care environments, from larger hospitals to residential care homes. Its sleek, wall mounted design is simple to use. It is the perfect call assistance device for staff, patients or residents, whether positioned alongside the bed or in more general areas. Unlike the Call Point Basic, the Call Point Standard uses RFID technology (Radio Frequency Identification) to identify and track staff and it can be paired with our Wearable Call Point. The Wearable Call Point is a stylish portable call device that’s ideal for both care home residents and assisted living inhabitants. Its lightweight, comfortable design allows users to get on with their day-to-day lives safe in the knowledge that help is close at hand. Based on a wristwatch design, the skin friendly silicon wristband is perfect for raising an alarm when assistance is required, wherever the user may be. The Call Point Plus has all the functionality of our Call Point Standard, with the addition of a full duplex VoIP speech device. The Call Point Plus is ideal for use in most care environments, from larger hospitals to residential care homes and assisted living programmes. Its sleek, wall mounted design is simple to use and is the perfect call assistance device for staff, patients or residents, whether positioned behind the bed or in more general areas. The Call Point Plus allows staff, patients and residents to speak with each other through its VoIP intercom system, offering the instant reassurance of human interaction. 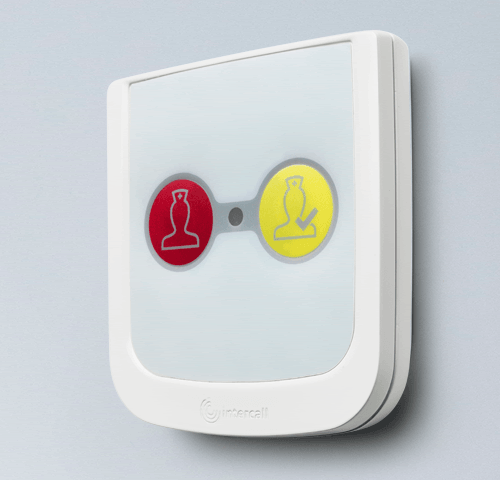 The Safeguard point is used to control the monitoring functions within a bedroom. Its sleek wall mounted design allows this unit to be positioned either side of a bedroom door for simple staff operation. Care management teams can configure individual cards via an easy to use programmer, assigning staff ID cards with the appropriate user name and access level. Staff response and movement in the care facility are recorded, helping prove good care is happening. The Pear Lead is a simple, individual call device for use in care facilities for less mobile patients. The Touch Display Plus has all the functionality of our Touch Display, with the addition of a full duplex VoIP speech device. The Touch Display Plus is the heart of the Intercall Touch Series. Perfect for larger hospitals or smaller care residences, the Touch Display Plus is the central hub of the Touch Series nurse call system. Ideally installed on a desk, the Touch Display Plus is the primary nurse call system staff interaction point. It helps nursing staff with monitoring while notifying them of calls and alerts on the system. The Touch Display Plus allows staff to speak to patients and residents through its VoIP intercom system, allowing them to decide the most appropriate response. The Bathroom Pull Cord is ideal for hospitals, care homes and assisted living residences. The Pull Cord is paired to a central call point, providing the call address and reset function. 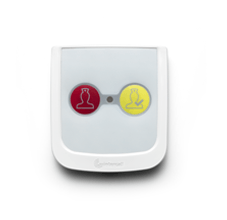 The Safeguard sensor monitors rooms where the resident is prone to falling or wandering at night. Positioned on the ceiling the Safeguard sensor passively monitors bed occupancy using thermal imaging detection to provide accurate motion readings. The Corridor Display is an advanced information call system that is ideal for hospitals or large care facilities. The metre wide information panel can be wall or ceiling mounted in corridors to provide a quick, clear call indicator to busy nursing staff. Just a note to say, Excellent Service, thank you. Order placed yesterday at 11:17am, parts arrived today in the mornings post.